What is the most deadly species on the planet? The mosquito! No really, more people die from mosquito bites every year than any other kind of animal on the planet. That’s great and all, but what about the hippo picture? Well, the highly territorial hippo takes an impressive second place in the most deadly beast competition. 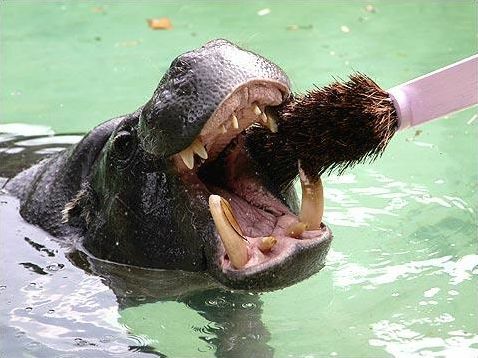 Whether on land or in water, expect a lesson in hippo etiquette if you invade its personal space. For some reason though, they’re just fine with you brushing their teeth with a giant pink toothbrush. © No known copyright restrictions. Please contact us if you know the creator of this image.